When the Estipona Group was hired for our branding expertise by the new owners of Downtown Vision – a professional eye care provider located in, wait for it, downtown Reno – we decided to provide a new area of focus (this stuff just writes itself, people) to local eyecare marketing. Our goal: to position the need for corrective eye wear as an opportunity to express style and personality — and clearly, to establish Downtown Vision as the Reno resource for getting your style on. We established a new brand identity for them via a new website, an invigorated social media presence and other marketing pieces. While we embraced their existing logo – a sleek downtown silhouette – we freshened it up, placing more emphasis on “Vision” (after all, that’s the service they provide) and using a more timeless sans serif font. Because we knew we wanted the website to be fashion-oriented, we needed custom photography. We recruited actual Downtown Vision clients, gathered up loads of hot eyeglass frames and started shooting. We photographed one group, including the providers, in the office against bright/high contrast colored backgrounds. For the providers, we captured them both as professionals and in a way that reflected their personalities. We created looks around each pair of frames much like a fashion show. And we let our customer/models awesome personalities shine through. The second group of customers were shot in fun, recognizable downtown Reno locations. 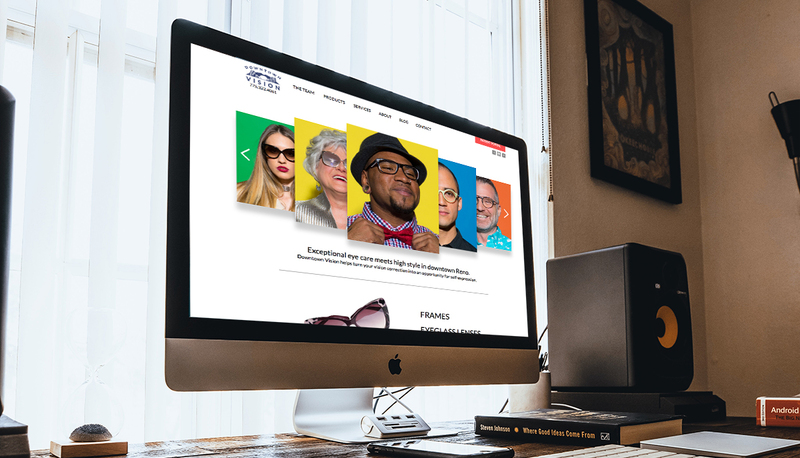 With images in hand, we were able to build out the website, focusing on the high-end, high-fashion frames and their ability to transform an individual’s look. Animated gifs help demonstrate the variety of options available to customers. With the website live, we will now start digging into their social media channels, enhancing content with our great new images and building more engagement. Much of our focus will be encouraging Downtown Vision clients and providers alike to show off their personal sense of groovy spec style. So, who did wear it best? Follow them on Facebook and Instagram so you can see for yourself! Does your company need a brand re-boot? Do you need help identifying the unique you-ness that will serve to better connect with your audience? Do you enjoy ridiculous puns as much as we do? Give us a shout!